Do you want the look of hardwood without the price? Consider vinyl flooring! Whether you are building a new home or upgrading your existing one, vinyl is a viable and affordable choice for new flooring. Durable and practical, it has boundless textures, colors, and patterns and various styles to choose from. Our expert flooring technicians also offer vinyl flooring installation to ensure your floor lasts for years. Install vinyl plank flooring when you want floors that look like slate, marble, or wood. Vinyl sheet flooring resembles stone, tile, leather, and even metal, while vinyl tile flooring gives you various design options to create patterns and custom looks for any room of your home. All of these flooring options are affordable, easy to maintain, and strong enough for active lifestyles. For homes with children and pets, vinyl sheet flooring is a great option. The most durable style of vinyl flooring available, it stands up to scratches and withstands the pressure of active households. So easy to clean, these vinyl types of flooring is especially ideal for big households or homes with dogs and cats. A mop and broom is all you need to maintain your new floors. Vinyl sheet flooring is also budget-friendly, so you do not have to make sacrifices for a beautiful floor. This works for a family who wants a cost-effective way to remodel their home and improve its value. It’s an easy way to replace old, worn-out, or damaged flooring with something new and fresh. With plenty of styles to choose from, this flooring works in any room of your home to match the existing décor and furniture. Another affordable option for any household is vinyl plank flooring, also known as luxury vinyl tile (LVT). Hard enough to imitate the look and feel of grainy wood or smooth stone but comfortable to walk on, it is the most elegant version of vinyl flooring available. Pick your preferred colors and textures to match the existing theme of each room. If you prefer a modular format for your tiles, vinyl tile flooring has the characteristics of luxury vinyl tile that you love with the versatility to create customized patterns. Whether you want a checkboard design to make your kitchen look like a diner from the 1950’s or an elegant bordered pattern for your modern bathroom, vinyl tile is the right way to go. Allow our professionals to install your new vinyl floors. Our team of experienced flooring technicians has the tools and knowledge to properly install each flooring option we offer. We make sure to lay down vinyl tile flooring in a way that ensures it lasts throughout the years, and we back up our work with the Ultimate Confidence Guarantee. If you are not satisfied with your new floor, we replace it for free. 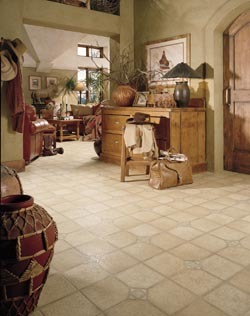 Contact us today to shop our selection of vinyl tile flooring. We offer professional vinyl flooring installation for homes in Charleston, Mount Pleasant, Sullivan’s Island, Isle of Palms, and Daniel Island, South Carolina.